Cut salmon into 4 fillets, about 4 oz each. In shallow glass dish or plastic container, place salmon fillets skin side down. In small bowl, mix Marinade ingredients; pour over salmon. Cover; refrigerate at least 15 minutes but no longer than 1 hour. Meanwhile, in food processor, place Aioli ingredients. Cover; process until well mixed. Set aside or refrigerate for longer storage. Set oven control to broil. Place rack in shallow roasting pan. Remove salmon fillets from marinade; reserve marinade. Place salmon skin side down on rack in pan. Broil with top of salmon 4 to 6 inches from heat source 10 to 12 minutes, brushing 2 times with marinade, until fish flakes easily with fork. Discard any remaining marinade. Serve salmon fillets with aioli. Serve with cooked asparagus or a mixed green salad. Want some spice? Stir one small serrano or jalapeño chile, stem removed, seeded and finely chopped, into the aioli. 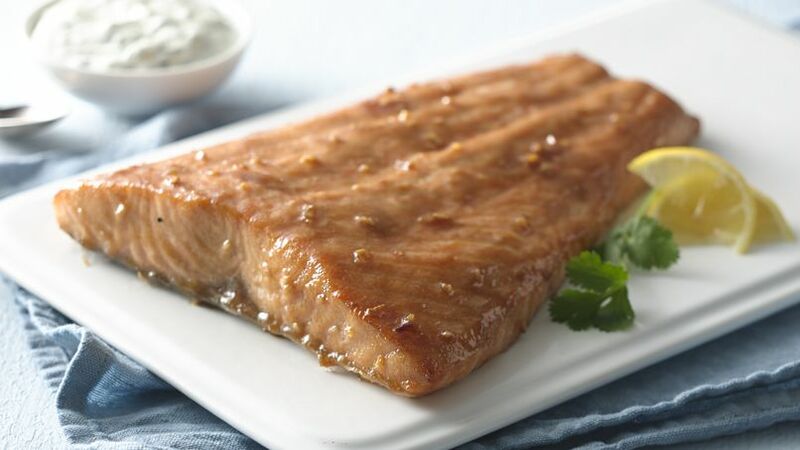 Broiled salmon glazed with honey and mustard makes a flavorful fish dinner.